As another nor'easter moves into the Maritimes, many schools, offices and businesses in New Brunswick have been forced to close on Thursday. As another nor'easter moves through the Maritimes, many schools, offices, and businesses in New Brunswick were forced to close on Thursday. 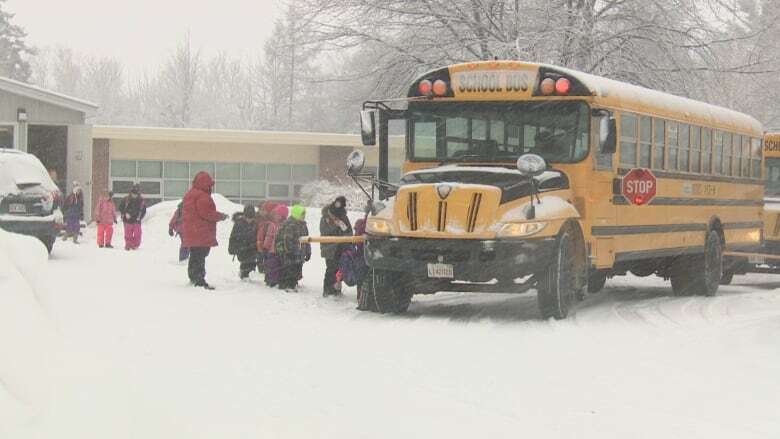 All schools in the Anglophone South School District were closed and all schools in the Francophone South School District are closed except Fredericton and Oromocto. In the Anglophone North School District schools were closed in the Rexton area. In Anglophone East, schools were already closed because it was a professional learning day for teachers. As the day wore on, closures in eastern New Brunswick began to pile up. Federal government offices in Moncton closed early, as did Mount Allison University and the University of Moncton. Codiac Transpo said it would suspend service at 6 p.m. Environment Canada issued a snowfall warning for Moncton and southeastern New Brunswick, where 15 centimetres of snow or more was expected. As another nor'easter moves into the Maritimes, many schools, offices and businesses in New Brunswick have been forced to close on Thursday. 0:56"The snow will be accompanied by strong northeasterly winds which may give reduced visibility in blowing snow," according to the warning. A special weather statement was in effect for most of the province. The snow in southeastern New Brunswick was expected to taper to flurries Thursday night. Environment Canada advised residents to adjust their driving with changing road conditions. "Surfaces such as highways, roads, walkways and parking lots may become difficult to navigate due to accumulating snow." RCMP caution motorists after responding to at least two accidents in the eastern part of the province Thursday afternoon. In one of the accidents, a tractor-trailer jack-knifed on the Trans-Canada Highway near the Nova Scotia border. RCMP spokeswoman Cpl. Jullie Rogers-Marsh said high winds caused the vehicle to lose control, since the trailer was empty and had nothing to weigh it down. No one was injured and the highway was cleared a short time after. Route 15 near Shemogue was also reduced to one lane because of a collision. Today: Cloudy with flurries or light snow. Snowfall near 2 cm except between 5 cm and 10 cm near Miramichi. Northeasterly winds will be travelling between 30 km/h and 50 km/h. Temperatures are expected to be around –1 C.
Tonight: Cloudy with flurries in the northeast with northerly winds travelling between 20 km/h and 40 km/h. Temperatures will drop to a low of –5 C.
Friday: A mix of sun and cloud in the northeastern parts of the province. Skies will be mostly cloudy with flurries in the northeast. Temperatures will be at a high near 3 C.
Today: Cloudy with snowfall amounts of about 10 cm of snow. Northeasterly winds will be travelling between 30 km/h and 50 km/h. Temperatures will be at a high near 1 C.
Tonight: Cloudy with a few flurries. Northeasterly winds will be travelling between 20 km/h and 40 km/h. Temperatures will be at a low near –2 C.
Friday: A mix of sun and cloudy. Temperatures will be at a high near 4 C.
Today: Cloudy with periods of snow and blowing snow, with snow heaviest in the southeast. About 15 cm of snow is expected in the south, except in Moncton and southeastern areas where 20 cm of snow is expected. Northeasterly winds may reach 60 km/h. Temperatures will be at a high of 1 C.
Tonight: Cloudy with snow continuing in the southeast throughout the evening. Additional snowfall of 5 cm is expected in the southeastern part of the province. Northerly winds will be travelling between 30 km/h and 50 km/h. Temperatures will be at a low of –4 C.
Friday: A mix of sun and cloud in the southwest. Mostly cloudy with flurries in the southeast. Temperatures will drop to a low of –4 C.